One of the richest and most beautiful monasteries we visit, is called Vatopedi, established in the 5th century. Golden coins, gilded chalices and spectacular church art is everywhere. But it is also the home of a great treasure not made from gold, but from camel hair – preserved from the earliest times of Christianity. – This is the belt of the Virgin Mary, says the monk Evstathios. According to written sources the belt was preserved in Jerusalem until the year 400. 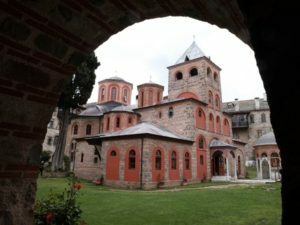 After being in Constantinople for some years, it was given to the monastery of Vatopedi as a gift. – This belt didn’t only perform miracles at one point in history, but to this very day. Every 14th day or so we receive messages from all over the world from people who have been healed or helped after having been in contact with the belt, says father Evstathios. The Orthodox claim that in the same way as God performed miracles through even the clothes of the apostle Peter (Acts 19, 12), the same thing happens through the belt of the Theotokos. Father Evstathios point to a series of strange stories related to the belt. Especially childless couples are helped, but many different diseases have also been cured. – An oncologist from Switzerland came to see us and was given a few bottles of oil. He himself did not believe the stories, but he wanted to conduct some experiments after having heard about the phenomenon. He gave it to all the patients who were close to the terminal phase. Some did not survive, but two of his patients were fully healed. He came back to us in the monastery and told us about it. We don’t know why some are healed and others are not, but we use the oil in faith, and see what God wants to do, says father Evstathios. Each of the Norwegian pilgrims are given a bottle, and father Johannes are given several – for use in the Orthodox Church in Norway. Towards the end of the stay the Norwegians hear a rumour about a Scandinavian monk at one of the monasteries they were visiting – Karakallou. 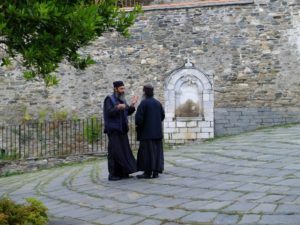 After having met mostly Greek monks on Athos it makes an impression to meet a monk with glittering blue eyes and a long read beard. Father Prothromos is from Finland, and speaks some Swedish. As it turns out that also he has a Lutheran background. – How did you become orthodox, father? – I went into an Orthodox Church one, and was so struck by the liturgy that tears started flowing. I realized immediately that I had to belong here, the monk says, echoing the story many of the Norwegian converts carry with them. Soon after his conversion 20 years ago, father Prodromos travelled to the Holy Mountain. Now he is head of the guest house in the monastery, and has had to learn several languages. – How is life here in the monastery? – It is very good. 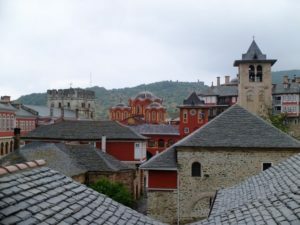 Since the monastery of Karakallou is not as large as the others (number 11 on the internal ranking among the 20 monasteries), it is not as busy as some of the rest. So I have plenty of time to focus on prayer, says father Prodromos, reminding us about what really matters in life.